I love this time of the week – the time I get the joy of joining together with brave writers all over the globe to write freely and with abandon for five minutes. No overthinking, no over-editing, just writing for the pleasure of writing. Want to play along? Visit http://www.lisajobaker.com for all the details. One thing I am good at is admitting the truth to myself. I know who I am and what I am, and there’s not much point in trying to kid around and fool myself, because I’m not falling for it. I’ve always been a black-and-white person with very little gray area, and in my mind right is right and wrong is wrong. It is what it is. The same is true of me. I am what I am, and what you see is what you get. Mostly. Today I’m going to tell you some things that are true about me. *I had a very messy childhood that involved a divorce, an absent father, and quite a bit of dysfunction and upheaval. I like to think I escaped unscathed from the icky parts but deep down I know I really didn’t. I just cover it well. *I don’t like to need people. I am fiercely independent, independent to a fault. I’m doing better but still would rather do things myself than depend on someone else. This is not a good way to make your spouse feel needed. *I am something of a lazy housekeeper. There are so many more interesting things to do than clean house, so I tend to do what is necessary for sanitary living and leave the rest. Do not ask me the last time I washed my baseboards because you will not like the answer. *I cover a canyon of insecurity with a fragile tent of good humor and quick wit (at least I like to *think* I’m funny). And I’m still wondering if people like me, even as I try to act like I don’t care. *I have two challenging children at home, and they are challenging in diametrically opposite ways. Sometimes I have trouble changing gears from the sensitive one to the controlling one, and I rarely talk about my parenting challenges because I feel so inadequate to the job. I feel like no one is going to understand my particular circumstances and it’s going to come across as whining, so I just keep it to myself. So there are some true things about me. What about you? It’s that time again! Time to link up with some of the bravest people I know – writers – and write freely for five minutes on a one word prompt given by our fearless leader, Lisa-Jo. Want to play along? Visit http://www.lisajobaker.com for all the fine print. What is it about that face? Those big, beautiful blue eyes. The shy smile that reveals a glint of metal on her teeth, in the process of making her even more perfect, as if such a thing were possible. The face we first saw through the miracle of an ultrasound screen, a 3D image that was so clear, when she was born we felt we had already met. She steps through life to the beat of a different drummer, so different it sometimes seems she must be off the beat. Oh, she might not be hearing the same rhythm you’re hearing but rest assured that she’s in time with her own music. I love this about her, that she’s not afraid to be who God made her to be. She doesn’t let the world push her around into some cookie cutter version of what they think a teen girl should be. I love the look of concentration on her face when she’s working out a math problem, and I love the dreamy look on her face when she’s writing a story or composing a song. She’s growing into a young lady and I try to capture these images, these moments, so I can pull them out one day when these days are long gone and I sit on the porch in a rocking chair. What she is, is amazing. And she’s mine, God’s gift to me. My miracle baby. I wish I was an artist. I envy those people who can draw and paint a realistic sunset, or even an intriguing abstract piece. I am drawn to symmetry and I’m a perfectionist, and the combination of the two does not make for good art. Sadly, this represents just about the extent of any drawing talent I possess. It’s a stick figure drawing of my daughter’s sleeping position, just in case you can’t make it what it’s supposed to be. The significant part of the story has to do with WHY I would draw it. Last Tuesday night I had the opportunity to meet up with some local ladies who will be attending the Allume conference next month. (Woot! Can’t wait!) I cleared it with the hubs and we made arrangements to get daughter #3 home from gymnastics that night, which is usually my job. My husband made plans to pick her up so I could get to my meetup on time. But then came the hard part: telling said daughter that Daddy would be taking her home and not Mommy. This particular child still struggles with some separation anxiety (even at age 9), especially when it comes to me, and when I say she doesn’t like going to bed without me tucking her in, I mean she really does not like it. I have no idea where the worry comes from, just that it’s real and it’s significant. So when I told her I was going out, she needed to know if I would be home before she went to bed. When I told her I wouldn’t, she and I started negotiating to find a solution that would make her feel OK about me being gone. She likes to for us to check on her after she’s asleep and often she will ask us the next morning what position she was in, so I suggested that I draw her in her bed to show her how she was sleeping when I checked on her, and then leave the drawing on her floor so she could see it in the morning. Somehow that was enough to satisfy her. I was steeling myself to refuse a request to wake her up and kiss her goodnight whenever I got home so I think I got off pretty easily this time. 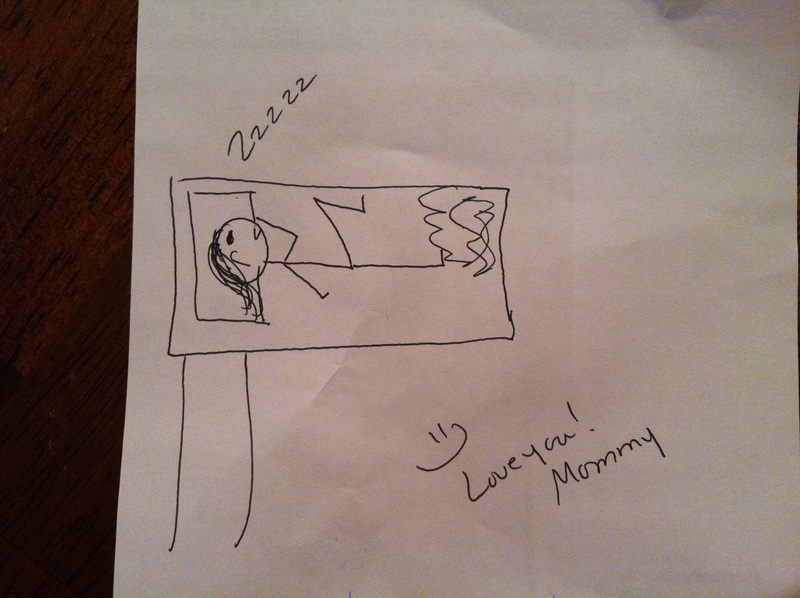 Here is my pitiful drawing, proving that I did indeed check on her when I got home. Simple, yes, but it was enough. I’m linking up with the fun crowd over at http://www.crystalstine.me for Behind the Scenes, where we tell the stories behind the pictures we share all over the web. Join us? It’s my favorite writing day of the week! It’s that party to end all parties with the uber-brave writing crew of Five Minute Friday! You know the drill: you write for five minutes on the prompt given, with no editing or backtracking, then you link up with all the other writers (yes, that means you) at http://www.lisajobaker.com. That’s where you can find all the fine print, should you want to play along. Ready, set, go! “Lawd, have mercy!” I can still hear my Grandma saying that. And Uncle Jesse on “Full House”: “Have mercy!” Usually it came up when things in life got difficult or confusing. We like to toss that word around a lot and yet I think we don’t understand what we’re talking about. I once heard grace described as “getting the good things you don’t deserve” and mercy described as “NOT getting the bad things you DO deserve”. That’s how I learned to tell them apart. If that’s true, then every single day of my life is full of mercy because I? Am a sinner. What I deserve is punishment, death even. Yet somebody took that punishment for me so I don’t have to suffer for what I’ve done. He went willingly to take my place. Past all my failures to the point of my need. Mercy came running to me. Now it’s your turn. Let’s see what you’ve got! I have a confession to make: I have control issues. I know, I know – if you’ve spent any time with me at all you probably already know this. Trying to hide it is like attempting to hide an elephant under a teacup. It’s just not going to happen. But life at my house has been somewhat chaotic in the past few months and now that the worst of it has apparently passed, I feel fairly safe in writing about something that happened to me earlier this year. I think it needs to come out of the closet, as it were, in case we’re not the only family who is dealing with this sort of thing. Our youngest daughter was adopted into our family at the tender age of nine months. She was adorable! At first she was a little standoffish, but that’s understandable given that she was unceremoniously handed off to these two odd looking pale-faced people who spoke to her in a language she couldn’t understand. Very soon she was giving us smiles and looking to us to meet her needs, and we figured it would all be smooth sailing from there. Oh sure, we’d heard stories about attachment disorders but those things happened in other families’ adoptions. Our daughter was adjusting just fine. At first it was a little amusing to see how she tried to exert her control. After all, she was a little toddler and I was her much bigger Mommy. She could try all she wanted but in the end, Mommy’s way was going to win. Her persistence was admirable, however, and her decibel range extraordinary. It was hard to predict what would set her off. Some days she was sunny and easy to get along with, and other days would find us butting heads over which of us was going to reach over to the table and put the cup of milk in her hand – me or her. Oh yes. She wanted to tell ME what to do and order me around. And that just wouldn’t do. There’s something in mr that rises up and roars whenever someone tries to boss me around but that’s a separate post for another day. We had plenty of tantrums that left both of us sweaty and panting from exertion – hers from the actual tantrum and mine from holding her in my arms while telling her over and over how much I love her, and how nothing, nothing, would ever change that. See, I thought that maybe some of the anger was born of her loss at such an early age and I hoped to extinguish it by reassuring her of my love. Nope. She only wanted me to let go of her. Well, first let go and then do whatever it was she was trying to get me to do. As she got older the tantrums got further and further apart. Actually, “tantrums” is probably not the best word. “Rages” is more accurate. She usually only fell apart for me and behaved just fine for her Daddy. I told myself it was because she felt she could trust me enough to let it all out, which may actually be true. The time between rages was just enough to lull me into thinking it was a phase that was over. And we didn’t share with our friends about what was happening at our house. It felt shameful somehow, like if we were good enough parents we could figure out how to handle this. Dr. James Dobson would certainly never advocate giving into a child rather than have her fly into a rage but sometimes I did just that. It truly got to the point where I was a little bit afraid of her – not that she’d physically hurt me, but that I’d have to deal with a sweaty, screaming hour-or-longer rage, and the toll it was taking on my emotionsl health and our relationship. Not to mention that I was afraid of my own frustration toward my little girl. This year she started sharing the “joy” of her temper with her Daddy too. So we were alone on our little island, surrounded by periodic “hurricanes” of rage, too ashamed to tell anyone what was really going on. “The battle is over but my knees are still shaking. The wounds are still fresh and bleeding from the verbal shrapnel flung at me in the course of one short half hour. In the history of me, I cannot recall another time when I felt so beaten down and cornered by any one person. The wrath I witnessed was unlike any I had ever seen, yet it was familiar too. The fact that this explosion was coming from my 8 year old daughter makes the whole situation all the more horrific. Look, I’m not naïve: before we adopted I did all the research. I know that adopted children sometimes have issues that are specific to their background. So when the tantrums (rages, really) started around a year and a half of age, I didn’t take it personally. I held her, consoled her, whispered in her ear that I would always love her, no matter what. And I do love her. Those rages would sometimes last for an hour, with both of us sweaty and exhausted by the time she finally calmed down. But I worry what the continued anger may do to our relationship. Since the beginning, I have been the preferred parent. I know my husband doesn’t want to hear that but it’s true nonetheless. We called her the “Velcro baby” because she seemed to be stuck to me constantly. When she was a toddler it was cute and somewhat expected. When she was four and we signed her up for K4 at the local elementary school, she screamed when they tried to take her into a room and do some fun testing. That was a little worrisome, but we chalked it up to possible delays. After all, she spent eight months in an orphanage. Some delay is to be expected, right? And she’s always been intense. Fierce, even. If she loves you, she loves you with all her heart. If she hates you, likewise. As she grew, the rages got further and further apart, to my everlasting relief. But in the past few weeks I could see her getting more and more wound up, and her anxiety at bedtime only stoked the fire, and the smoke started to rise from our household volcano. She freaked out when I gently mentioned that we might need to call her pediatrician to see if the doctor could help her get to sleep. And yet when we rolled into our second week of bedtime agonies and daytime eruptions I knew I had no choice. It took some to doing to get her there because she truly didn’t want to go. She tried to make me promise not to tell the doctor about her sleeping issues, which resulted in another epic skirmish on the way to school this morning. But what can you do? I said what I had to say to get her to school in a somewhat normal frame of mind. And so when I took her in and the nurse asked her right away if she was having sleep problems, I knew I was in for it later. We both talked to the doctor, and then the doctor sent my daughter out to color so I could speak frankly, and I finally let it all go. I told her about the anger, the anxiety, the need for control, and how it’s been going on for years. I told her that I can’t tell if it’s a behavior problem, or if she can’t help it, or if it’s some of both. We talked about things I could do to help her fall asleep, all of which we’ve tried. Melatonin? She refuses to take it. She brought my daughter back in and told her she must sleep in her own bed (not in her sister’s room), she must take the melatonin, and she must obey her parents because it’s our job to take care of her. My child looked directly at the doctor and told her, “No!” That was uncharacteristic of her, because usually her defiance was only aimed at me. It was then that I realized my drive home was about to become my worst nightmare. The doctor told me she would refer us to a therapist (not the developmental/behavioral pediatrician I was hoping for) and she’d let me know in the next week or two. Meanwhile if things got worse I was supposed to let her know. We hadn’t even left the parking lot when it started. The screaming. “You PROMISED! !” The tears, and she hates to cry, so that made her even madder. That such a small person could have so much rage inside would have seemed unbelievable if I wasn’t living it myself. She told me that just for that, she’s not going to go to sleep for the rest of her life. Then she proceeded to tell me how much she hated the doctor, she wished the doctor would just die, she’s never going back there, I’m never going to call that doctor, she’s going to punch the doctor in the face, over and over again. And then she started on me. Same sentiments, different subject: she hates me, wishes I would die, etc. At one point she actually drew back her fist as if to hit me (she didn’t). In between wishing me and the doctor dead, she was screaming at me to run red lights, drive 140 miles an hour, hit the car in front of me, etc. I had had enough. My baby was miserable, she was angry and out of control, and there seemed to be nothing I could do to help her. So I cried. When she realized I was crying, she screamed at me to stop crying. 30 minutes into her tirade she started slowing down and the screaming evolved into mere cranky whining. 45 minutes after it started, the bullets stopped flying. But, oh, the scars they leave behind! “It hasn’t been long enough since the last skirmish for me to forget the pain and frustration it caused. You’d think that a little time could start the healing of the wounds inflicted in the heat of battle, but not enough time has passed. Yet, here we go again. Monday morning. Wake-up time. She went to sleep too late the night before, both her parents stumbling around like zombies, willing to try just about anything if only she’ll settle down and at least try to fall asleep. The time change, well that shortens an already short night by another hour. So what happened was not entirely unexpected – in fact I would almost say it was understandable. As soon as her Daddy went upstairs to wake her, the screaming began. Get off me! Stop it! And not just a loud voice, but a high pitched scream, over and over. But schedules must be adhered to, breakfast must be eaten, clothes must be put on a small and weary body, so she must get up. I am busy downstairs making breakfast, but my mother’s heart cringes with every cry. Our older daughter is confused and alarmed at the chaos right outside her bedroom door. Suddenly the mayhem escalates. She has a nosebleed, so her Daddy tries to apply pressure to stop the bleeding, and all she does is scream and fight with all 53 pounds of her, while he tries to hold her still and take care of her. “Helpless” seems too weak a word to describe the desperation I feel listening to what sounds like a child who sounds like she must be in agony. Finally I can’t take any more so I go up to offer my help. Her relieved Daddy hands her over to me, kicking and screaming. Five minutes later, the bleeding is stopped and she blinks back tears, telling me she doesn’t want to go to school. Of course she doesn’t. I send her back to bed and go back to breakfast prep, talking with my older girl like our house did not resemble a war zone just a few short minutes ago. Can you imagine? Mount Vesuvius erupts upstairs and we all try to pretend nothing happened. But now I’m coming clean: we have an anger problem in our house. And it’s not just my daughter. I don’t often talk about God speaking to me but there are times when He speaks so clearly, it’s like he’s in the chair next to me. I was driving one day, in the car by myself, thinking about my littlest girl and what I could do to help her. I was peeling back the layers, trying to determine what it is that pulls the trigger on her anger, and I thought about how she likes to be in control, to know what’s coming, and that even though she knows deep down that we, her parents, have her best interests in mind, she still would rather do things her own way. It was at that moment that God whispered in my ear: “She IS just like you, isn’t she?” Well. I think my mouth may have dropped open. And I had to admit that yes, I treat God the Father much the same way that my girl treats me. I want to call the shots. And when things don’t go my way, I sometimes have a little tantrum of my own, trying anything and everything to manipulate the situation. Here I was trying to solve the problem on my own instead of turning to Him. As usual. But God just keeps on loving me the way I am and gently trying to redirect me. I wish I could say that I had an epiphany that day, prayed about the situation, changed the way I approached parenting this particular child, put a lid on my own anger issues, and we all lived happily ever after. As you know, real life doesn’t always work that way. We have been seeing a therapist for the past few months and things have improved considerably. Oh we still have the occasional sleepless night, and sometimes the volcano starts to smolder but overall it’s much, much better around our house. I don’t know what she and her therapist talk about when I’m not in there but whatever it is it’s working. Our first meeting there was a turning point for me because I realized that I was afraid of my own child. Or more accurately, her reactions. I was doing a pretty good job of hiding from my girl just how much her rages were affecting me, but then the therapist made me describe the problem while my girl was sitting on the couch right next to me. It struck me that I was reluctant to talk about it because I didn’t want my daughter to see my weakness, thinking that it might give her more power over me. Yeah. I’m a little twisted. So there’s a lot of healing going on. I still have days when she pushes my buttons and I have to stop and pray right then. But for the most part, it feels like we’ve weathered a storm together and come out on the other side. Now I have to ask myself: what advice would I give another parent who is facing the same anger/rage storm? Because I know, I know, we can’t be the only family dealing with this excessive anger. One thing I have felt impressed upon my heart is that I need to love her unconditionally, no matter how she’s behaving. There were times that my attitude toward my daughter was less than loving when she was screaming hateful words at me, but I felt God telling me that I needed to let love win. When my emotions are warring and I don’t know which way to turn, let love win. If I don’t know how to react to something she’s said or done, let love win. When I’m not sure what to do, react with love. Sounds simplistic, I know, but it’s helping. Colossians 3:12-14 lists an admirable group of Christian virtues and then says in verse 14, “And over all these virtues put on love, which binds them all together in perfect unity.” Put on all these wonderful things and then put love over the top of all of that. So there it is. I want you to walk away knowing that I love this girl of mine with all of my heart and I will do whatever it takes to help her grow up healthy and happy, just as I have done and will do with her two sisters. I don’t have all the answers and I certainly don’t pretend to. I will readily admit that I am a work in progress. But whenever I’m faced with a choice between two or more options, I pray that I can always let love win. She’s angry, this girl of mine. She’s really truly mad, red-faced and screaming, and I get it. I get it because I’ve been in that place myself, and I know what it is to feel the blood rushing into your face and the anger flooding your body and to feel absolutely helpless to stop it. The anger, it’s like red-hot volcanic lava and it pulses in every vein and artery in my body and although it’s the feeling of powerless that brings it on in the form of frustration, giving vent to it makes me feel even more powerless. As I imagine she must feel. And so I have to make myself stop, so I don’t answer anger with anger. I stop, and I pray a desperate, silent prayer, and I open my arms to her. And while she doesn’t run into them headlong, she does shuffle over and allow me to pick her up and put her on my lap. And then we cry together. Being OK & My First Giveaway! I’m a planner. I know where I want to go, so I like to make a plan and work the plan. I’m also a little bit of a control freak, so when my plans don’t quite work out, well, I’m not much fun to be around. Is anybody else that way? Sometimes my plans don’t lead me where I wanted to go. It’s like my GPS maps are outdated and the place I thought I was headed is not the place I ended up. Or maybe I’ve just been following the wrong road. And then there are the times when I’m expecting big things. I’m in the middle of a situation and I know, I just know, God’s gonna work this thing out. I feel it. “Well, God, I’m ready. Let’s see you move.” And He doesn’t. At least not then. What happens when the place you’re in is not the place you want to be? What do you do? How do you make peace in that gulf between where you are and where you want to be? Stacey Thacker, author of Hope for the Weary Mom, has some great ideas about that very subject. In her new book, Being OK With Where You Are, Stacey tackles some hard questions about how to handle it when life doesn’t quite turn out to be what you wanted it to be. And now for the fun part: the giveaway! Up for grabs is one PDF copy of Stacey’s new book, Being OK With Where You Are! Enter by leaving a comment below, and I’ll draw one name at random and announce the winner on Monday. Good luck!